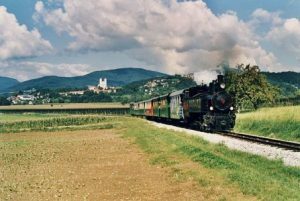 Board the train with me at the Station Square in Weiz ready for an exhilarating journey through the dramatic Feistritz valley. A short jolt and we are off! 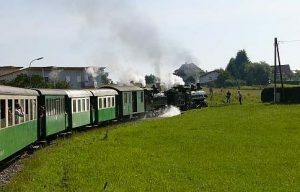 We cross the Weiz – Gleisdorf main line, and then go in a long curve towards the halt at Büchl. Loud pounding from the engine and a lower speed mean that we are beginning to cross the first chain of hills. Towards the north, there is a wonderful view of the Weizburg church. 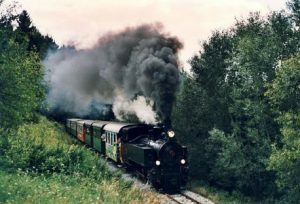 Shortly after Büchl, the train disappears into the woods for the first time. The line crosses many tributaries of the river Ilz as it follows the steep rise of the Raasberg, whith gradients of up to 1 in 40. After we have crossed the 59m long Nöstl viaduct, we arrive at Peesen halt (4.9 km, 470 m). Shortly after come the Peesen (42m) and Baz (59m) viaducts. As can be seen, the bridges on the Feistritztalbahn make extensive use of the then new concept of reinforced concrete arches. 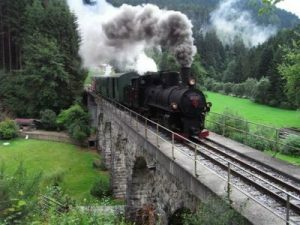 After passing through Bachl halt (6.1 km, 483 m) we cross the Bachl viaduct (93m) which, as an exception, was built using the more traditional masonry, or cut stone. 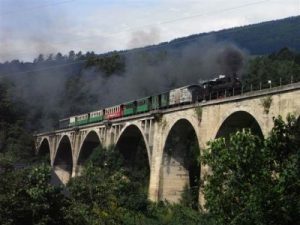 Now, at 7.8 km from Weiz, we come to the absolute highlight of the whole route – the 267m long Grub viaduct. With its four main arches of reinforced concrete, and a further nine secondary arches, any mainline would be proud to own it! 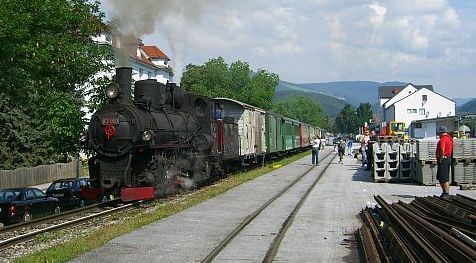 Shortly after the viaduct, the line crosses the main road and reaches the former site of the halt at Hart-Puch (8.5 km, 510m). Since the road was widened, it is now only recognisable by a single siding. Here, at the highest point of the first section, the 223m long Hart tunnel cuts through the summit of the hills. Next, the track drops down again into the Feistritz valley, where at 10.8 km it crosses the river by the 133m long Feistritz viaduct. Shortly after this the line reaches the former end of the StLB section of the line – the loading station of the talcum quarry. Modern goods wagons, and a cable carrier for material indicate that until recently active goods traffic was in operation. 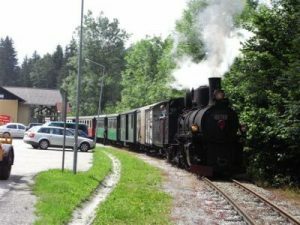 In the meantime, the state railway has withdrawn completley and the whole line from Weiz belongs to us. 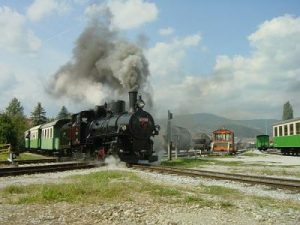 A little later the train reaches Anger, where it makes the first scheduled stop. 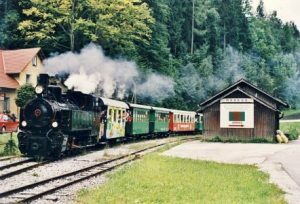 The romantic station at Anger greets its guests with a happy motto: “Look no further, look no longer – not Mallorca, but Anger!” The locomotive takes on water, and then climbs steeply, past the ADA factory, and on towards Birkfeld. The landscape then rapidly changes its character. The valley closes in, the railway and road intertwine and cross several times, between rocks and river, through the increasingly narrow valley. 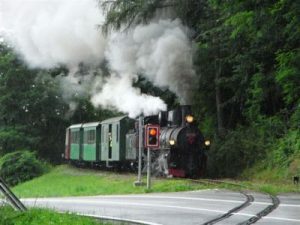 The train passes through the halt at Rosegg, at 18.8km enters the 93m long Frondsberg tunnel, and shortly after reaches Koglhof. 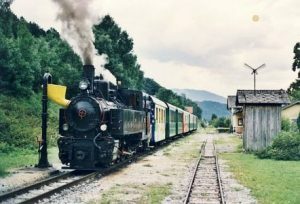 The station is now a guesthouse and bakery, and is the end of the journey for our passengers who want to use the summer toboggan run which can be reached on foot in a few minutes. 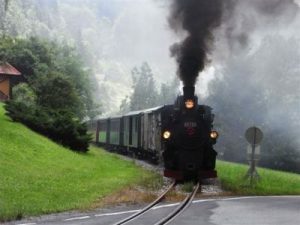 The train journey continues through the 106m long Kirchleiten tunnel (20.9km) and over the 78m long Hollosbach viaduct. During a thunder storm on 14th July 1918, the centre section of the original bridge collapsed, and was eventually replaced by a steel structure. Hollosbach viaduct shortly before Birkfeld. 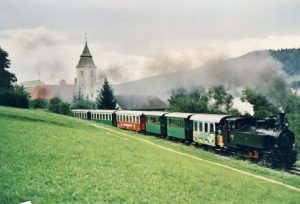 At 22.7 km the train crosses the 90m long Birkfeld viaduct, and soon after the town of Birkfeld can be seen high up on the hill. We have arrived at our destination! Including all stops, the whole experience has taken about two hours. The return journey is faster as it (unfortunately!) only takes about 67 minutes. The next section from Birkfeld to Ratten is history, and is now a cycle route.